Value Investing » Public » How to Select Stocks for Your Value Investing Portfolio? Part 1 in this series of articles introduced the concept of business lifecycle (or product lifecycle). Part 2 takes the same concept and presents it in the form of a BCG Matrix that can be used to make strategic decisions about managing your portfolio investment (products, services, stocks, real estate, etc). In this article, we will take these concepts and adapt them to present an empirical process a value investor can use to structure his or her portfolio and manage it over time taking into account his or her various capital allocation constraints and investment risk. Reduced to its simplest form, value investing is about finding stocks that can be purchased at a significant discount to the intrinsic value of the company. However, as any practicing value investor knows, value stocks come in different shades of value. Part of it is the degree of undervaluation and the rest lies in the manner in which value may be realized, estimated holding period, and existence of catalysts. Add to this the need for keeping a optimally diversified portfolio, and the active management of the portfolio becomes complex. It is hoped that the process I am laying out in this article will give a certain structure to the portfolio construction process without taking anything away from the “art” of value investing. We will again use the BCG Matrix framework introduced in the Part 2 of this series. However, we will adapt the matrix so it is relevant to a value investor’s portfolio. The idea for an investor is to use the Cash Cows to fund the Question Marks until they either turn into Stars or become Dogs. Dogs are harvested. Question Marks: These are the stocks that are highly undervalued according to one or many of the valuation metrics. They may not have anything else going for them other than undervaluation. If you buy these stocks, you might end up waiting a long time to see the valuation gap close with a profit or it may come tomorrow. Quite often, some of these companies may bob along in the undervalued bucket and if they are not generating profits, the risk is that the value in the stock might erode over time. There are 2 distinct outcomes for these stocks. There may be a change in the environment that allows the company to generate value for the shareholders. For example, a sale of the company, liquidation of assets, change in management, new product that is well received, FDA approvals, etc. In this case, the stock will quickly move to the Star quadrant. Absent these events, the stock may stay undervalued for a long time and eventually become a Dog. The idea is to buy these stocks and wait for something to happen. Most value stocks belong to this category. As a result, the risk of capital loss is drastically reduced (this does not mean the volatility of the stock will decrease. Volatility is what the market does and you can’t control. Risk is the possibility of capital loss that you can control to a large degree with diligence). Eventually all Stars fade. Done right, most will yield outstanding profits, but fade they will, nevertheless. Some Stars may end up with excellent competitive advantage in their industry and may become Cash Cows. Others will end up as Dogs and will need to be liquidated. Cash Cows: Cash Cows are a curious bunch of value stocks. To be frank, they may not be considered strict value by traditional practitioners of the value investing philosophy since the value in these stocks is not derived from tangible assets. Indeed, most of the value lies in their earnings power. As long as the company is able to maintain an above average margins and dominate its market, the company can continue to generate above average returns for investors who had the foresight to buy the stock at a reasonable discount. These companies are said to possess a durable competitive advantage, also known as moat. There is a certain lure to investing in Cash Cows. They are generally considered safer although in reality this is not always true. I would rather invest in a company that is valued at $100 million but has net assets conservatively worth $150 million then invest in a company where value lies in the business being able to maintain or grow its above average profitability. If there is any constant in the business world, it is the fact that competitive advantage erodes over time. New competition comes in, technologies change, consumer behavior changes, product is no longer relevant, etc. No one, not even Coca Cola (KO) is immune from competitive pressures. Besides, future earnings cannot be predicted with any useful degree of certainty. There is company risk as well as macro economic risk (note: precision is not the same as accuracy). My use of the term Cash Cow here does not imply that the stock pays a good dividend. It may or may not. However, dividend payout rate is immaterial. If the business generates excess cash which is not paid out, the stock price will reflect the accumulation/re-investment. 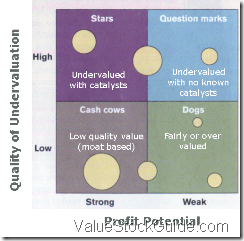 In absence of a dividend, you could generate cash in this quadrant by harvesting parts of your cash cow holdings. Dogs: Dogs are the stocks where the valuation gap has either closed (fairly valued) or has inverted (over valued). Ideally the gap closed as the stock price rose to meet the intrinsic value, in which case you realized a profit. In some cases, the investment thesis may not work out and the intrinsic value actually declines leaving you with a loss. Regardless of the reason or the returns generated, Dogs need to be sold. You may also want to push a stock to the Dog quadrant if it fails to return value within a time frame you are comfortable waiting for. This stock may not be a dog and could have excellent investment merits, however your investment process may require you to sell a stock in 2 years (for example) and chalk it off to an unknown mistake in your stock selection process. It may or may not be a “right” move, but sometimes you just need to make a decision, kick it out, and move on. Using this BCG Matrix like framework gives you a good basis for giving a structure to your portfolio. Most value investors tend to rely on their gut and intuition which may not work well at all times. Cash Cow stocks and Dogs generate cash. Stars and Question Marks consume cash. Additionally, another source of cash for your portfolio may be your periodic contribution to your investment account. If you are running a closed portfolio, for example in a tax deferred account that may not see a cash infusion for some time, you may want to maintain a higher portion of cash cow stocks. Over time though, with a focused yet reasonably diversified portfolio (10-20 stocks), you will have frequent exits (harvesting Dogs) to provide liquidity to fund Question Marks and Stars. Fresh ideas are basically your Question Marks and Stars. For a young investor, focused primarily on maximizing rewards, a large part of the portfolio will be in these 2 quadrants. Perhaps as high as 75%. Some will be in the Dogs quadrant while Cash Cows will be minimal. For a Large portfolio though, you will end up with over allocating to the Cash Cow quadrant and your portfolio performance will suffer (similar to Warren Buffett’s portfolio). This is primarily because you have a better chance of finding Question Marks and Stars among smaller stocks and with a large enough portfolio, you are constrained for investing in these stocks unless you turn your portfolio into an index fund clone. Value investing is a process that you have to trust to a large extent. Fortunately, there is overwhelming history to support your trust in the process. You will have occasional stocks that do not work out, but if you focus on finding value, over time your portfolio will work out better than average. To make sure you do not get sidetracked with market sentiment or other irrelevant hype, you should focus on value and not price through this process. After you have harvested a stock, you should review your original investment thesis and the actual outcome and if necessary refine your stock selection process. A value trap is a dog from the start, isn’t it? The problem is that a value trap is an after the fact definition. There is no way to determine a value trap before you buy the stock. The best way to limit your risk of ending up with a value trap is to insist on a business catalyst that you estimate has a high probability of occurring. The other way is to limit your holding of an unprofitable position to a finite time, such as 2 years. It is not profitable to agonize over whether you made a mistake. If it turns out you did, realize it and move on. That being said, what may be a value trap today may actually be a terrific investment tomorrow. Things change, including the business and the management. It is not wise to pigeon hole an investment in the value trap category and ignore it forever. It is interesting to see that many of the concepts I present here are easily intuited, but are often wrongly applied. For example, the saying “let your winners run” works for cash cow stocks but only when there is sufficient value in its moat. In most cases though, when winners become dogs (over valued), they should be liquidated. Additionally, value investing does not have to mean a long wait for the Mr. Market to come to its senses. You can short cut the value realization process by looking for potential catalysts. P.S. This article builds upon some of the earlier concepts and presents an original way of looking at active portfolio management for value investors. I use this in my own practice. I plan to expand this to build a rigorous framework that we can all benefit from. Your questions, critiques, feedback, ideas, etc posted in the comments below will bring in a wider variety of views and insights and will be much appreciated. I want this to be a real world methodology as opposed to a purely academic one that any investor can use. this is a beautiful and helpful article…thank you so much! @fsdfsdf Glad you like it and it can be of practical help. I appreciate your visit. Thanks! Since I use BCG concept in my portfolio strategy, I have appreciation of such useful tips for individual investors, over gloom and doom columnists like Paul Farrell, Behavioral economist in Market Watch website. Thank you. Great to see other investors using some of the same techniques and hope it is working our great for you. All I can say is that the columnists get paid by the number of words :). Frankly, as Buffett has said many times, it has never paid off in the long run to bet against the US market and I am sure this is true for a number of economies around the world. i bought 3D when it was high and wrongly thought it would be a good value stock when it was going down. I realize that i bought it rather too soon. I have lost close to 50% and failed to sell in time. Only of recent it has slowly started to gain. Should i leave it or get out. i would appreciate your suggestion. Hi Krishna, I cannot provide specific stock advice on a public page as you can understand. You could email me via the contact form at the bottom of the page and I will give my opinion. Thanks for your thoughtful piece. It was an informative read. I was wondering how you weight your portfolio selections? Thank you for reading. Glad you found it informative. Thee portfolio selections are weighted typically by the risk I perceive to exist in any particular idea. Higher risk ideas are weighted less, while lower risk ideas are weighted higher. Keep in mind that Risk for me is not the same as volatility – I consider risk as the possibility of capital loss. Dividends also mitigate part of the risk, and so do an expectation of an immediate catalyst. So in the end it often turns out to be more of an art than a science.